Here’s an idea no developer has ever thought off: let’s make a piano library. I know, I know. The world really frigging doesn’t need another deep sampled piano library with a hundred microphones to choose from. So I didn’t make one. Instead I made you something very different. The Lobby Piano is an exploration into what a piano can be. A collection of sound design piano tones ranging from experimental playing styles to completely recharged sound explorations. The Lobby Piano is at home in pretty much everything you do. It’s not really a piano anymore. Really it isn’t. I recorded sounds from a single piano (located in a lobby, duh) with an assortment of orthodox and unorthodox methods and tools (a hammer and a keychain were involved among other items). Still this is not an effects piano nor a prepared piano. It’s a designed piano. The Lobby Piano requires Spectrasonic's Omnisphere 2.5. The Lobby Piano takes up 578 MB of hard drive space. 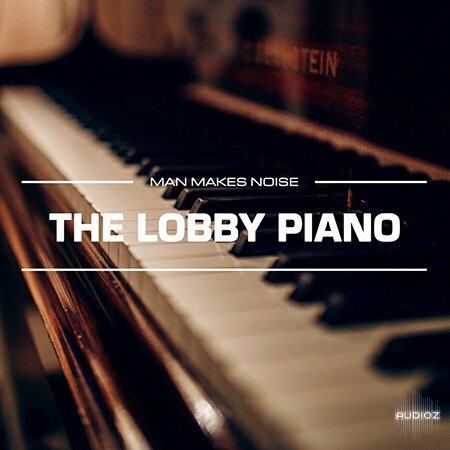 Man Makes Noise The Lobby Piano FOR SPECTRASONiCS OMNiSPHERE 2 has been exclusively released on AudioZ by Fantastic who chose to ask not to post mirrors. good sound design, some sounds are very cpu intensive but great sounds.